UNITED NATIONS, Jan 12 2016 (IPS) - In 2015, the number of international migrants reached 244 million – a 41 percent increase compared to early 2000 – according to a United Nations report, released on January 12. Of those 244 million migrants, 20 million were refugees. 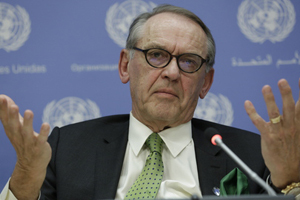 The report – titled “Trends in International Migrant Stock: The 2015 Revision“ – was presented by Jan Eliasson, U.N. Deputy Secretary-General, along with Bela Hovy, Chief of the Migration Section of the Population Division, at the U.N. Department of Economic and Social Affairs (UN/DESA). Produced by the UN/DESA, the new dataset showed that nearly two thirds of all international migrants live in Europe (76 million), Asia (75 million), North America (54 million), Africa (21 million), Latin America and the Caribbean (9 million) and Oceania (8 million). The United States hosts the largest number of international migrants (47 million), which equals to one fifth of the world’s total, according to UN figures. Trailing behind the United States are Germany and Russia, with 12 million respectively, Saudi Arabia with 10 million, the United Kingdom with nine, and the United Arab Emirates with eight million. Drawing attention to refugees, Eliasson noted how particularly relevant migration is for population growth. “Between 2000 and 2015, positive net migration contributed to 42 percent of population growth in North America and 32 percent in Oceania. In Europe the size of the population would have fallen in the absence of a positive net migration”. The international community, he said, must focus more on the “positive narratives of international migrations”, such as remittances, exchange of international labour and the economic contribution of migrants to both the country of origins and the recipient country. Currently, the three main countries with the highest outflow of refugees are Syria, Afghanistan and Somalia, where the population is forced to flee due to political conflicts and lack of infrastructures, social and public services for men, women and children, said Eliasson. “Migration should be safe, orderly and regular” – he said- “although we have seen that this is not the case today.” He highlighted the need to design good policies in the host countries, and ultimately solve the problems in the countries of origin. It is also necessary to support countries of transitions, such as Lebanon, Jordan and Turkey, in developing the adequate infrastructures and humanitarian responses to welcome refugees, said Eliasson. Reinforcing this view, Hovy said: “It is important all these groups of migrants have rights, especially the right of refugees not to return to their countries where their life and their routine is at risk, and the right to seek asylum”. Back in November 2015, U.N. Secretary-General, Ban Ki-moon, announced the need for a roadmap on the large movement of migrants and refugees. First, the UN, along with UK, Kuwait, Germany and Norway will address the fourth Financial International Humanitarian Pledging Conference for Syria, on February 4, in London. 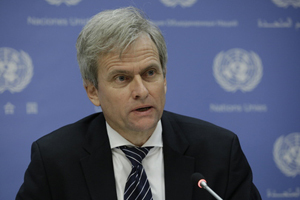 Second, the Office of the U.N. High Commission for Refugees (UNHCR) will hold a conference in Geneva on March 30 on resettling Syrian refugees. Third, the international community will gather at the World Humanitarian Summit, on May 23-24 in Turkey.